I searched through about a zillion products before coming upon this one. It is exactly what I wanted. RFID and I particularly like the fact that it completely zips shut. Inside there is room for your passport on the left, credit cards on the right. There is a deep pocket for cash or other papers behind the credit card slots. 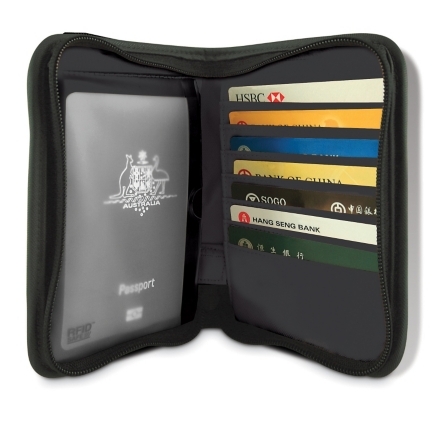 This wallet is large enough that if you had to carry passports for a few of your kids or some other type of papers, they would probably fit inside and you’d still be able to zip it. The only problem I have with this wallet is that it is bulky to wear around the neck but the attached cord makes it possible to do that. The cord is so long that I was able to wear the cord around my neck for security and still have enough slack that I could carry the wallet in my pants pocket for easy access. It is 4″ x 6″ and it would fit in a pocket of a jacket or your front pockets of a pair of khakis, but probably not a jean pocket or back pockets of any kind. I can see myself using this one for years to come.